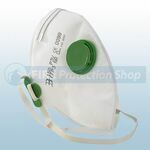 Available from Fire Protection Shop are a range of dust masks that include P2 valved mask, P2 fold flat mask p2 fold flat valved mask, p3 fold flat valved mask, comfort mask, p1 mask, p1 valved mask and p2 mask. All of these masks are available in packs. Also available is the Bitrex fit testing kit which is used to ensure your employees are protected correctly and is also a good way to train them in the correct way of fitting a mask.